All Americana including throwback sounds from American Beauty and Workingman’s Dead, two classic Grateful Dead albums. 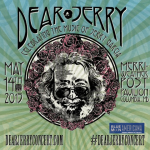 We’ll also feature a track from Bob Weir’s latest, Jorma, David Grisman, and Chris Hillman…all in celebration of the new Jerry Garcia tribute album. We’ve also got some incredibly satisfying new releases from The Dustbowl Revival, Nikki Lane, and The Devil Makes Three. Thursday morning Americana sounds for Sonoma County community radio listeners. 27 J Shogren Shanghai'd Swampland Why So Blue Bird? 28 Dwight Yoakam I Wouldn't Put it Past Me Swimmin Pools Movie Stars.